WebConnoisseur – Page 4 – Dustin Woodard's thoughts on search, social media, filmmaking and the web in general. In the SEO community, there’s been debates as to whether you should bother using search engine webmaster tools. Thanks to the latest set of data Google is providing, there is more reason then ever before to create a webmaster tools account for your sites. Help identifying issues – learn about crawl errors, robots.txt issues. Ability to submit things like sitemaps, canonical preferences, or report spam or malware. Giving the engines too much information – personal emails, IP, site network, etc. The information provided was far from spectacular, so why bother. The ranking & impression data I find the most interesting. I’ve long used analytics tools to pull out the page 2 queries, for example, but having exact ranking, impression and click through data helps webmasters better understand areas to make improvements, the meaning of dropping from a #1 ranking to a #2, how much personalized & geographical search components might affect ranking, and the wide variety of rankings & words any one page can have. It would be nice to see the data be more specific & reliable (right now clicks of less then 10 during the reporting period leave us with essentially no data). Ensure to employ a good enterprise link building company as the links generated by them will help you grow your business and generate revenue. Preferabbly, all the new data shared in Webmaster tools would be included directly into Google Analytics, but I’m happy to see the new data & hope they continue to expand the data set. Nice work Google Webmaster Tools team! SEOs have long been preaching the importance of anchor text in links and have long pointed out LinkedIn as a great place to gain keyword-rich links. Hundreds of thousands of LinkedIn users have followed this great advice, but something changed late last year that no one else seemed to notice. Note from Dustin: This SEO tip is a reward for those following my blog. I’ve kept this one secret since late last year so I could share it at Searchfest during my talk on Reputation Management earlier this month. I’m sharing it here as a reward for people who have been following me, but will not be actively promoting this tip as I don’t want it to be discovered by too many people, causing LinkedIn or Google to make changes. Again, marketing optimisation, including myself, have long been preaching that the links you share in your LinkedIn profile should use custom anchor text so instead of the link saying “My Website” or one of the other generic terms, it could pass along a keyword-rich link. For example, my link to this site said something like “Dustin’s SEO Blog” so I was at least giving Google or other engines a better indication to what the site is about–something that is deemed very important in their algorithms. Well, my advice has changed. Why? Turns out LinkedIn went the way of Twitter & other popular UGC sites and no-followed all the links. Let me say that again, in case you missed it: LinkedIn links no longer count in the eyes of search engines! This is unfortunate as I believe those links should count. There’s no need for LinkedIn to hoard their link juice and the links are limited, transparent, and attached to real people with real business networks. It also gives spiders a chance to discover small sites it may not discover otherwise. I’m not familiar with search spammers using LinkedIn to game the search engines, but I suppose it may have happened enough for Google to pressure LinkedIn. For those who link to their LinkedIn profiles a lot, the fact that LinkedIn is not linking back to your site (even though you specifically tell it to do so) might be enough reason for you to reconsider. You’ll notice that I highlighted “My Website” and “My Blog.” If you choose one of those two, you will get a followed link from LinkedIn. Unfortunately, you won’t be able to customize the text as you can with the “Other” choice, but at least the links will count. If you are a person who has a lot of different sites, I’d recommend using both My Website and My Blog & using one of the other choices as you prefer (knowing you won’t get link love). Take a look at my profile for an example: Dustin Woodard on LinkedIn. And if you haven’t already done so, you should be using a custom URL (see settings – I used “woodard” so my link is http://www.linkedin.com/in/woodard instead of some random number). There you go, a free SEO tip of great value to pretty much anyone on the web. To better explain Wired magazine’s reference to mike siwek lawyer mi searches, I created this experimental blog post. Wired’s excellent article on Google’s algorithm links off to the search phrase: “mike siwek lawyer mi”, which sends you off to Google’s search results page for that query. 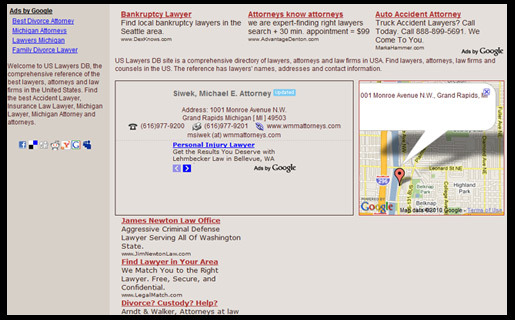 The top result connects to a listing for an attorney named Michael Siwek in Grand Rapids, Michigan. It’s a fairly innocuous search — the kind that Google’s servers handle billions of times a day — but it is deceptively complicated. Type those same words into Bing, for instance, and the first result is a page about the NFL draft that includes safety Lawyer Milloy. Several pages into the results, there’s no direct referral to Siwek. The ironic part is that everyone who is reading the article gets a Google search page that is in no way superior to the Bing because the results have been flooded with coverage of the newly popular search. The fact that this listing is so buried leads me to believe the search engine result that Google’s engineers were so proud of was result 4 that I list above, which is simply an address database site that is borderline spam and riddled with Google ads. I count 28 different Google adsense ad listings if you include the next ads arrow tabbing, or 11 without the tabbing. No wonder Bing didn’t want to list this page! The only thing that is slightly impressive about this search is that Google thought to replace Mike Siwek with Michael Siwek. I don’t mean to beat up on Google too much. I could certainly come up with many examples where Google’s algorithm is superior to Bing, but as an SEO consultant who is paid to constantly monitor the ugly flaws of search engine algorithms, I find this example of “Google’s algorithmic dominance” humorous & worry about the simple mindedness of Google’s top engineers when it comes to evaluating improvements in their algorithm. 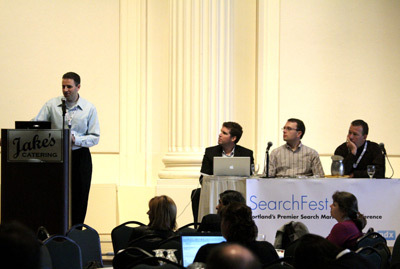 Something recently reminded me of an event early in my web marketing and SEO career. For me, it was a very pivotal moment of my career; for you, it might be an entertaining story of a consulting douche bag and how SEO battles don’t change much. Roll back the clock to a little over a decade ago when cell phones were bricks generally seen only in movies and Prince’s “Party Like It’s 1999” was forward-looking. I graduated from the University of Washington with a couple finance-related degrees and began working for, surprise, a financial company. After quickly proving that my abilities went beyond filling out paperwork for clients and managing portfolios, I spent my time on “special projects”, which included things like investing research, Y2K compliance, & building our web presence. I quickly discovered the importance of search engines and was quite successful at driving leads & press to the site & company. 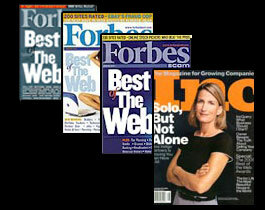 In 2001, I had increased their assets by over $50 million, was named “Best of the Web” by Forbes three times, and was even selected by Inc Magazine as the best marketer of the year using techniques that have changed little to this day (but now have names). How was this success rewarded? They brought in a consultant. My boss’s friend was unemployed after his start-up went belly up. I won’t name him, but will describe him. 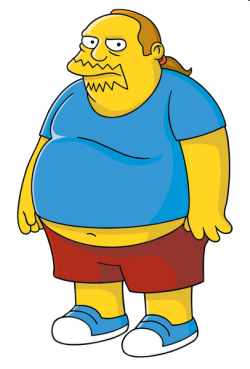 He looked very much like the Comic Guy on the Simpsons – he was large, sported a red goatee, and a greased back pony tail. His previous occupation was as a conservative radio talk show host (seriously – I’m not kidding) and as you can imagine, he was a talker. He loved buzz words, though a true understanding of them was of little importance. And now he was a consultant. Things seemed a little backwards. If you looked at our resume’s & track records at the time, you would have guessed I was consulting for him. Considering it was my boss’s friend and upper management was wowed by the fancy words and whiteboard drawing, who was I to question the new relationship? To this day, I can’t recall a single person I couldn’t work with–other then this guy. He was a bully and I was his young prey. His big idea was to change our various sites to a single flash site. When I warned him that search engines have trouble with Flash, his response was that “no one uses search engines to find websites.” Apparently countless web analytics reports showing all our traffic sources wasn’t enough for him, nor was an export of our client referral source records, nor the daily stories of new clients who found us via a specific search query. Facts meant little to this talk show host, unless the facts or half-truths supported his cause. After much back and forth, it was clear that it was his way or the highway. I decided to take a very large risk (especially considering this was during the dot-com crash & a troubling time for the stock market) – I crafted an email to the President and Vice-president of the company explaining that the direction we were heading in was going to hurt us and that I was ready to leave the company if they continued to use his “services.” Clearly my boss would want to fire me for going over his head and making him look bad, but it was a risk I had to take to restore my sanity and keep the company from driving directly into the brick wall in which it was undoubtedly headed. The story does have a happy ending. They did get rid of him and I used the existing sites to raise another $200 million (doubling the 20-year old company’s assets) before I left a couple years later to take my boss’s job at a larger company. The irony is that I am now a full-time consultant and he became an anti-consultant evangelist. From that point on in my career, I decided I would never stay silent when I saw the company I worked for start to take a wrong turn, even if it meant losing my job because I wouldn’t want to work for a company that ignored evidence and experience anyways. When you share a link on Facebook the summary text (or snippet) is usually displayed with the link. Sometimes they work well, other times they are completely random. Learn how to control exactly what shows up when a Facebook user shares a link. I wondered why it was such a poor summary, then I learned that Facebook uses the page’s meta description (same thing used by the search engines in displaying your page). The Webby Awards has no meta description, so Facebook tried to find the next best choice, which was the first paragraph in the code following the H1 tag. The problem is, most Facebook users don’t realize they can change it, or are too lazy to. Plus, you’d rather feed them with the text yourself. Solution: add a meta description tag to your pages, and make sure it is unique to the page (which will benefit your search engine display). No need to stuff keywords into your meta description because it will turn of Facebook users and it doesn’t help your search engine ranking (though limited keyword use can benefit from bolded SERPs). Notice the capital “D” on description? Search engines don’t care, but Facebook does. Change it to lower case and it will work fine. This will ensure proper Facebook snippets (casin on mEta or cONtent make no difference to Facebook). After making the fix, it may take Facebook some time to recognize the new meta tag if it pulled it recently. The link display name, or title, uses the title tag of your page (same as the search engines). There is no case senstivity here so this should rarely be a problem for you. Sometimes Facebook has trouble pulling titles and descriptions, but it is more a matter of their fetching mechanism, because it usually works – try again if you do end up with something weird. Valid values for medium_type are “audio”, “image”, “video”, “news”, “blog” and “mult”. Since Facebook has such a high user-base, other services, like Digg have adopted the same policies for summaries, thumnails, and mediums.